Bentley announced on Friday the 30th August, the opening of a new dealership in Stockholm, expanding the luxury British marque's presence in the Swedish market. Bentley announced on Friday the 30th August, the opening of a new dealership in Stockholm, expanding the luxury British marque’s presence in the Swedish market. The new showroom is located on Grev Turegatan, a major thoroughfare located in one of Stockholm’s main designer shopping districts, bringing the brand closer to its main customer base in the city and representing a significant long-term investment in the region. 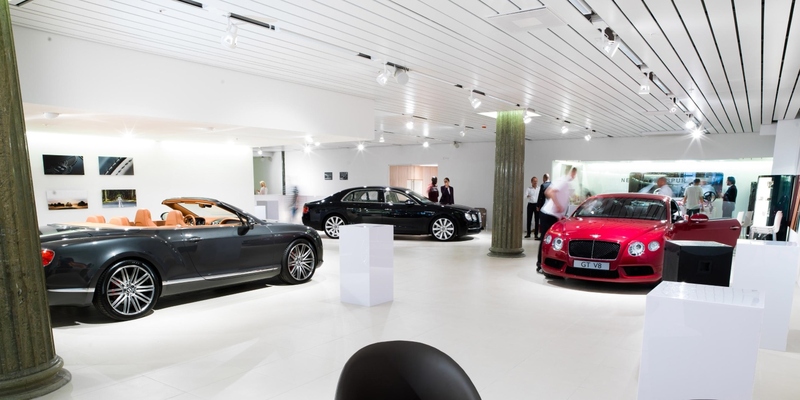 Bentley’s current premises in Sweden, located in the southern city of Malmö, will continue to serve customers in the south of the country, operating as an official Bentley aftersales and pre-owned sales centre. During the dealership’s official opening, Bentley Stockholm also presented the new Flying Spur to local customers for the first time. The new model blends effortless driveability, exquisite luxury and craftsmanship, sculpted design and state-of-the-art technology. It is powered by Bentley’s 6.0-litre, twin turbo W12 engine, and permanent all-wheel drive ensures the Flying Spur puts all 625 PS to the road, sprinting from 0-100 km/h in just 4.6 seconds. Bentley sales in Europe during the first half of 2013 grew by 22 per cent compared to the same period last year, and the company has ambitious plans to achieve further sales growth, through new model introductions like the Flying Spur and significant expansion of its dealer network.